EN shares 20 different ways (out of thousands) to increase your intake of all kinds of veggies. It’s not news that vegetables are an essential part of a healthy diet. They supply vitamins, minerals, dietary fiber, and naturally occurring compounds called phytochemicals that are associated with improved gastrointestinal health and vision, reduced risk of arthritis, heart disease, stroke, diabetes, and some types of cancer. Vegetables may work their medical magic due to the phytochemicals they contain, which help manage the replication and/or growth of cancer cells, stimulate the immune system, and exhibit antibacterial and antiviral effects. Recent research has shown that dietary fiber from green cabbage may be as effective as cholestyramine, a commonly prescribed drug to lower blood cholesterol levels, in reducing blood lipids. In addition, cruciferous vegetables, such as broccoli, Brussels sprouts, cabbage, and cauliflower may lower risk of colon cancer by manipulating genes that can cause cancer. Vegetable intake, particularly cruciferous vegetables, has been linked to a reduction in the risk of aggressive forms of prostate cancer. Conversely, diets that are low in vegetables may be a contributing factor to roughly 31% of ischemic heart disease and 11% of stroke worldwide. Overall, low-vegetable diets are estimated to be associated with 2.7 million deaths each year worldwide. The goal to increase daily vegetable intake has many associated benefits. 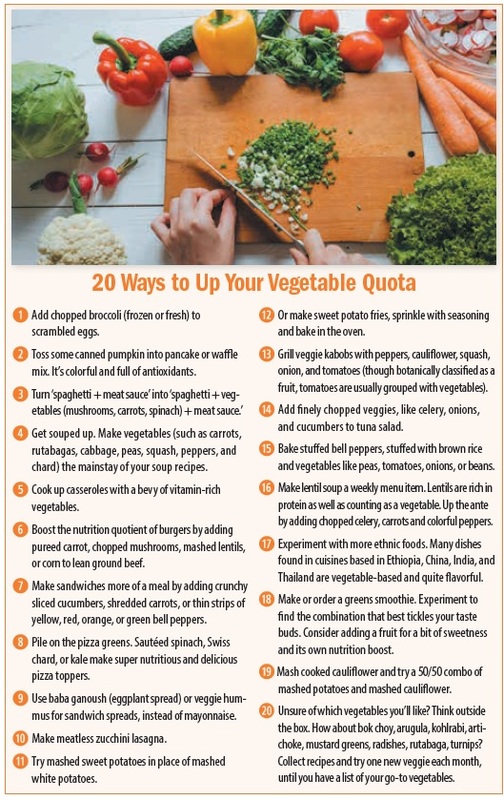 “Most vegetables are low-calorie (only about 25 calories/cup, raw), low in sugar, and a rich source of antioxidants,” says Allison J Stowell, MS, RD, nutrition communications expert and founder of Stowell Nutrition based in Connecticut. She cites recommendations that we should all aim to consume two to three cups a day; and to strive for even more if you’re trying to lose weight. Not only are vegetables low in calories, she points out, but the high-fiber content fills you up, helping to tamp down appetite. Tags antioxidant, antioxidants, appetite, arthritis, balanced diet, benefits of vegetables, blood cholesterol, blood cholesterol levels, calories, cancer, cancer cells, cauliflower, cholesterol, cholesterol levels, colon cancer, cruciferous vegetables, diabetes, diet, fiber, gastrointestinal, gastrointestinal health, health, healthy diet, heart disease, high fiber content, immune system, ischemic heart disease, Lose Weight, nutrition, Prostate, prostate cancer, risk of colon cancer, stroke, sugar, types of cancer, vegetables, vitamins, vitamins minerals.